If Isaac Newton suddenly popped out of a time machine, he’d be delighted to see how far physics had come. Things that were deeply mysterious a few centuries ago are now taught in freshman physics classes (the composition of stars is one good example). Newton would be stunned to see enormous experiments like the Large Hadron Collider (LHC) in Switzerland — and possibly perturbed to learn that his theory of gravity had been superseded by one dreamed up by some fellow named Einstein. Quantum mechanics would probably strike him as bizarre, though today’s scientists feel the same way. But once he was up to speed, Newton would no doubt applaud what modern physics has achieved — from the discovery of the nature of light in the 19th Century to determining the structure of the atom in the 20th Century to last year’s discovery of gravitational waves. And yet physicists today are the first to admit they don’t have all the answers. “There are basic facts about the universe that we’re ignorant of,” says Dr. Daniel Whiteson, a University of California physicist and the co-author of the new book "We Have No Idea: A Guide to the Unknown Universe." We know matter is made up atoms, and atoms are made up of protons, neutrons, and electrons. And we know that protons and neutrons are made up of smaller particles known as quarks. Would probing deeper uncover particles even more fundamental? We don't know for sure. We do have something called the Standard Model of particle physics, which is very good at explaining the interactions between subatomic particles. The Standard Model has also been used to predict the existence of previously unknown particles. The last particle to be found this way was the Higgs boson, which LHC researchers discovered in 2012. “The Standard Model doesn’t explain everything,” says Dr. Don Lincoln, a particle physicist at Fermi National Accelerator Laboratory (Fermilab) near Chicago. “It doesn’t explain why the Higgs boson exists. It doesn’t explain in detail why the Higgs boson has the mass that it does.” In fact, the Higgs turned out to be a heck of a lot less massive than predicted — theory had held that it would be about “a quadrillion times heavier than it is,” says Lincoln. 2. Why is gravity so weird? No force is more familiar than gravity — it’s what keeps our feet on the ground, after all. And Einstein’s theory of general relativity gives a mathematical formulation for gravity, describing it as a “warping” of space. But gravity is a trillion trillion trillion times weaker than the other three known forces (electromagnetism and the two kinds of nuclear forces that operate over tiny distances). 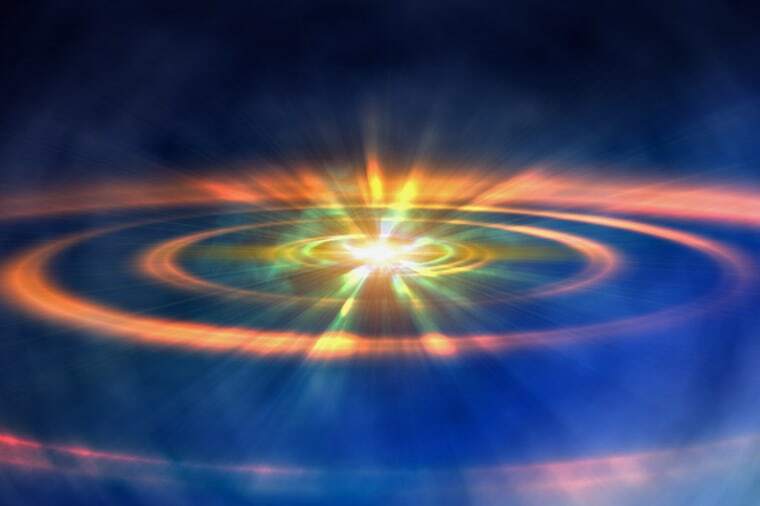 One possibility — speculative at this point — is that in addition to the three dimensions of space that we notice every day, there are hidden extra dimensions, perhaps “curled up” in a way that makes them impossible to detect. If these extra dimensions exist — and if gravity is able to “leak” into them — it could explain why gravity seems so weak to us. “It could be that gravity is as strong as these other forces but that it gets rapidly diluted by spilling out into these other invisible dimensions,” says Whiteson. Some physicists hoped that experiments at the LHC would give a hint of these extra dimensions — but so far, no luck. 3. Why does time seem to flow only in one direction? Entropy may be rising now because it was lower earlier, but why was it low to begin with? Was the entropy of the universe unusually low 14 billion years ago, when the Big Bang brought it into existence? 4. Where did all the antimatter go? Antimatter may be more famous in fiction than in real life. On the original Star Trek, antimatter reacts with ordinary matter to power the warp drive that propels the U.S.S. Enterprise at faster-than-light velocities. While warp drive is pure fiction, antimatter is very real. We know that for each particle of ordinary matter, it's possible to have an identical particle with the opposite electrical charge. An antiproton is just like a proton, for example, but with a negative charge. The antiparticle corresponding to the negatively charged electron, meanwhile, is the positively charged positron. Physicists have created antimatter in the laboratory. But when they do, they create an equal amount of matter. That suggests that the Big Bang must have created matter and antimatter in equal quantities. Yet almost everything we see around us, from the ground beneath our feet to the most remote galaxies, is made of ordinary matter. Some answers may come when the Deep Underground Neutrino Experiment (DUNE) starts collecting data in 2026. DUNE will analyze a beam of neutrinos — tiny, chargeless and nearly massless particles — fired from Fermilab to the Sanford Underground Research Facility in South Dakota, some 800 miles away. The beam will include neutrinos and antineutrinos, with the aim of seeing if they behave in the same manner — thus potentially providing a clue to nature’s matter-antimatter asymmetry. 5. What happens in the gray zone between solid and liquid? Solids and liquids are well understood. But some materials act like both a liquid and a solid, making their behavior hard to predict. Sand is one example. A grain of sand is as solid as a rock, but a million grains can flow through a funnel almost like water. And highway traffic can behave in a similar way, flowing freely until it becomes blocked at some bottleneck. So a better understanding of this “gray zone” might have important practical applications. “People have been asking, under what conditions does the entire system jam up or clog?” says Dr. Kerstin Nordstrom, a physicist at Mount Holyoke College. “What are the crucial parameters to avoid clogging?” Weirdly, an obstruction in the flow of traffic can, under certain conditions, actually reduce traffic jams. “It’s very counterintuitive,” she says. 6. Can we find a unified theory of physics? We now have two overarching theories to explain just about every physical phenomenon: Einstein’s theory of gravity (general relativity) and quantum mechanics. The former is good at explaining the motion of everything from golf balls to galaxies. Quantum mechanics is equally impressive in its own domain — the realm of atoms and subatomic particles. That hasn’t stopped people from trying. For decades now, string theory — which pictures matter as made up of tiny vibrating strings or loops of energy — has been touted as the best bet for producing a unified theory of physics. But some physicists prefer loop quantum gravity, in which space itself is imagined to be made of tiny loops. Each approach has enjoyed some success — techniques developed by string theorists, in particular, are proving useful for tackling certain difficult physics problems. But neither string theory or loop quantum gravity has been tested experimentally. For now, the long-sought “theory of everything” continues to elude us. 7. How did life evolve from nonliving matter? For its first half-billion years, Earth was lifeless. Then life took hold, and it has thrived ever since. But how did life arise? Before biological evolution began, scientists believe there was chemical evolution, with simple inorganic molecules reacting to form complex organic molecules, most likely in the oceans. But what kick-started this process in the first place? MIT physicist Dr. Jeremy England recently put forward a theory that attempts to explain the origin of life in terms of fundamental principles of physics. In this view, life is the inevitable result of rising entropy. If the theory is correct, the arrival of life “should be as unsurprising as rocks rolling downhill,” England told Quanta magazine in 2014. The idea is highly speculative. Recent computer simulations, however, may be lending support to it. The simulations show that ordinary chemical reactions (of the sort that would have been common on the newly formed Earth) can lead to the creation of highly structured compounds — seemingly a crucial stepping-stone on the path to living organisms. What makes life so hard for physicists to study? Anything that’s alive is “far from equilibrium,” as a physicist would put it. In a system in equilibrium, one component is pretty much like every other, with no flow of energy in or out. (A rock would be an example; a box full of gas is another.) Life is just the opposite. A plant, for example, absorbs sunlight and uses its energy to make complex sugar molecules while radiating heat back into the environment.